You wouldn’t know it to look at this picture, but this fountain stands in the center of the most congested traffic circle in Washington, DC. But if you are a pedestrian, this is a wonderful place to settle on a nearby bench and enjoy a brief respite. This B&W version has been submitted to this week’s running of the Monochrome Madness series managed by Leanne Cole. This is a great place to find some excellent monochrome images and it will appear on her blog on Tuesday morning, November 4th. In the meantime, only a short time remains for you to vote in the After-Before Friday Forum to select the lucky image that will be turned over to eleven photographers each of whom will perform their post-processing magic on it. Votes may be cast at Stacy Fischer’s VisualVenturing blog. 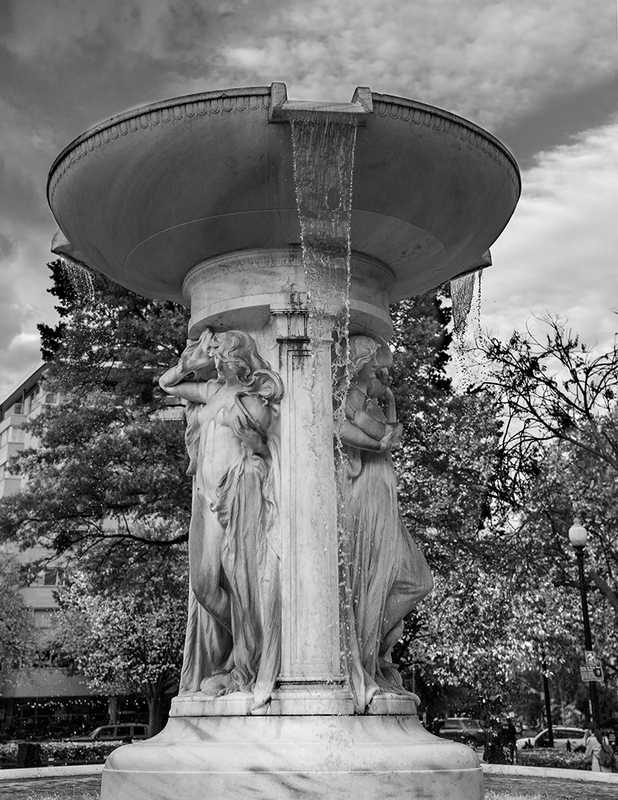 This entry was posted in Washington DC and tagged Fountains, Nikon, Photography, Washington DC by Robin S. Kent. Bookmark the permalink. Yes, the problem was here, not with your RSS. I accidentally hit “publish” instead of “schedule” after I had entered the text. It would have been pretty funny to have been here watching as I scrambled to upload that picture before too many people got the post with no image. Fortunately, it was just the one image, otherwise it would have been a very messy scene. Anyway, thanks for your note and the comments. Glad you did get to the image eventually. I hope to get back there soon and do a more thorough job. Thanks very much. I agree, the fast speed helps here. I didn’t have the tripod with me, so my usual approach of a longer exposure wasn’t in the cards. But the flow from this outlet in the fountain’s bowl was the most interesting (the other two had less water coming out)so the fast shutter speed seemed the best way to go. Hi Robin, another wonderful black and white image. I started participating in the monochrome madness a few weeks ago, and I have to say that I am finding so many more images look wonderful as black and white – they some how simplified and I see detail that I wouldn’t see if the image is in colour. I like how the clouds seem to be bubbling out of the top of the fountain! keep up the good work. Thanks, Janice. I appreciate your thoughts. Yes, Leanne’s series is a big help in reminding us about the value of the B&W medium. I was really happy to see those clouds when I walked into the Circle. I think the image would have been far less interesting without them. Beautiful B&W. I think for the fountain shooting it is better to use fast shutter speed. Then you can see how the water jet breaking into drops and shimmer in the light. With the slow speed shutter it looks like still water sculpture. Thanks for the comments, Alexander. You make a good point. I think I’ll use the faster shutter speed more often on fountains. Comparing the results from the two options might be an interesting exercise. It is just my vision of fountain shooting. Unlike, for example, waterfalls where slow speed many times is appreciated. Beautiful shot! The monochrome fits it perfectly! Thanks very much. I started working on it in color but it quickly became apparent that B&W was the way to go.